Custom Equipment will be posted here for review. Also please note whether you want your custom equipment to be added to the market for anyone to buy or not. Weapon Rank: Depending on materials: E or A. 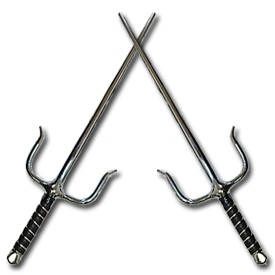 Description: Pata are in a simplistic wording, Guantlet Swords. The hand, wrist and forearm are covered on the outerside by a large guard or gauntlet. The inside has a gripping bar that makes it a very hard weapon to simply bash out of one's hand. The blades are 2 feet long, and have two-sided edges. They come in a metal version, which in all aspects is considered a leathal weapon, and a practice version, made of leather and wood, much like the Katana and its pratice form. They are easily used as one-handed or Dual-Weilding weapons. Damage: +5 (Wooden) or +100 (Metal) depending on material. Note: Do not add to the market. Are you making one or two weapons? please specify if you are making a training version or a battle ready version don't lump them into the same thing. Each of these permits must be one template for EACH equipment. That means if you are making a training version then it must be placed in it's own template. Description: Pata are in a simplistic wording, Gauntlet Swords. The hand, wrist and forearm are covered on the outer side by a large guard or gauntlet. The inside has a gripping bar that makes it a very hard weapon to simply bash out of one's hand. The blades are 2 feet long, and have two-sided edges. They come in a metal version, which in all aspects is considered a lethal weapon, and a practice version, made of leather and wood, much like the Katana and its practice form. They are easily used as one-handed or Dual-Wielding weapons. Description: Very similar to the standard Kunai, the only difference is the curved tip. Effect: This sacrifices its ability as a throwing weapon in exchange for greater ease of parrying other weapons and inflicting more gruesome wounds on helpless enemies. Effect: Five Kata are usually taught when wielding Sai. They're used both offensively, for quick strikes and jabs, and defensively for protection around the arms from other bladed weapons. They have unique movements used to flip between easy parries, to lethal stabs from the three prongs. Description: Appears a a length of thin yet though chain loops connecting two additional parts. On one side if a easy to use latch that will fit around most clothing. On the other end of the chain is a reinforced class lens. Effect: Allows use of any Jutsu requiring a glass object, such as Toomegane no Jutsu [Telescope Technique]. Description: Appears a a length of thin yet though chain loops connecting two additional parts. On one side is a easy to use latch that will fit around most clothing. On the other end of the chain is a reinforced glass lens. Requesting acceptance of soul shape before updating. Description: The 5’6” pole staff has evolved, the entirety is completely wrapped in what seems to be bandages tip to tip. Its has taken a rather flat shape being one inch thick and about four inches in depth. By spindling in 25% of the initial cost of the pole staff the bandages grow limp and retract instantaneously, wrapping around the blades hilt, going through flesh as they lose form for the time being, to reveal a 4’6” blade that tetters on being semi impractical. The blade is sharp to the touch and entirely capable of slashing through objects if its user can handle it properly. Changing Styles: By expending an extra 25% of the base cost the polearm can be turned into a nodachi blade that hides beneath its solid wrappings. This can be used in reverse as well.